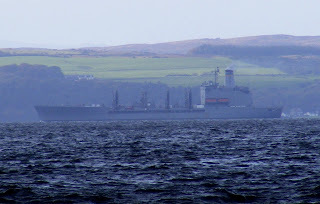 After a brief visit to Loch Striven, USNS Leroy Grumman outbound 18 October 2008. There must have been some issues as over two hours elapsed between the arrival of the tugs and pilots and the eventual slipping from the berth! yes, I was sat up on Crichton Road ready to take pics of her leaving but got fed up waiting so came home, few hours later i happened to look out of the window and she was just leaving so ran upstairs and got a pic, no idea what delayed her!